HUNTSVILLE, Ala. – A mid-sized, Huntsville-based defense firm is looking to fill a niche in the US Army's munition inventory with its Small Glide Munition (SGM) while preparing to field a similar weapon to US special operators. Dynetics' SGM is a 60-lb tactical munition that has – like the name implies – a capability to glide provided through wings that unfold after launch from a Common Launch Tube (CLT). The design is modular so the munitions could fit on a variety of platforms, according to the program manager for the SGM at Dynetics, who asked not to be named due to security concerns. The munition also packs a wallop with a 35-lb warhead, which means it's smaller in size than a Hellfire missile but its effect on a target is far greater than other smaller munitions. For example, Griffin, a small precision guided munition made by Raytheon, has a 13-lb warhead. But while it's a niche munition, it has application across many platforms beyond what Dynetics is developing for US Special Operations. "Key components can be replaced and upgraded, particularly with regards to the warhead and seeker," the company official said. And because the system is unpowered, it enables Dynetics to put more volume in the warhead and that is why it has a greater lethal payload than would be expected in a munition of its size, the official added. Last month, Dynetics was awarded a $11.65 million contract to conduct work on the SGM for USSOCOM, intended to be carried on AC-130 gunships or unmanned aircraft systems. The contract will support integration, qualification and testing prior to a planned fielding of the munition in 2017. SGM was recently designated by the US Air Force as the GBU-69/B. Dynetics is testing the munition at Eglin Air Force Base. According to a document -- labeled "For Official Use Only" -- required to justify a sole-source contract to Dynetics for the SGM from the Air Force Life Cycle Management Center at Eglin, the munition is the only glide weapon in the 50-lb class range that can be launched from a CLT with "a high degree of lethality." It also has a modular warhead that "can be removed and replaced without modification to other munition components in non-factory environments, the document states. The company’s solution also addresses "aspects of the 360-degree employment zone not covered by the powered munition," has a reduced launch signature and supports "engagement scenarios for which attack azimuth and impact angle must be precisely controlled." And the SGM is now under consideration by the Army for its Small Guided Munition contract. The company responded to the Army’s request for information released in February. "If you look at the RFI you will see the size requirement was for a 60-lb munition," the official said. "That is quite a coincidence to me, but, basically I think if you read it, they were looking for something that would be smaller, but more affordable than Hellfire," for such platforms like Gray Eagle which have weight constraints, the official added. Roger Eidsaune, the director of advanced programs at Dynetics, told an audience at the Space and Missile Defense Symposium August 17, that the SGM was built with "a particular customer in mind to meet a gap they had in their weaponry." And he added, "There was no new technology involved, it was innovating the technology into a package that could do that particular mission and do that quickly. We had to get if from when they asked to delivery quickly." 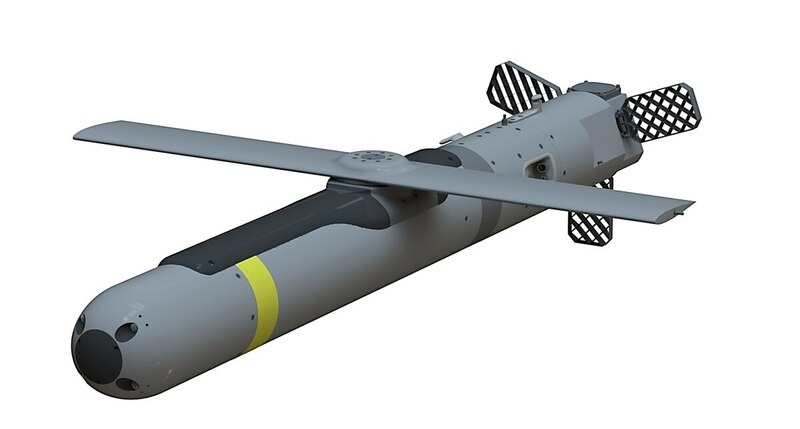 The munition, for example, uses a BAE Systems' Distributed Aperture Semi-Active Laser Seeker (DASALS) taken from the Advanced Precision Kill Weapon System (APKWS) for terminal guidance. According to Ronnie Chronister, Dynetics’ director for air and missile defense, the control fins, which allow the munition to glide, were taken directly from a Russian design. While building a 60-lb munition for SOCOM or the Army may not be as attractive for large prime contractors because the of quantities associated with the requirements, the market is just right for Dynetics to invest in niche requirements, the official noted. Finding solutions for niche requirements for Dynetics is not new. Yet, the first niche munition the company developed went a completely different direction than the SGM – the massive ordnance air blast munition or the "mother of all bombs," the official said. The bomb, that yields an 11-ton blast, was first built for C-130s. "That established ourselves as a niche provider," the official added. Aside from eying other possible opportunities for its SGM among the other services such as the Marine Corps’ V-22 Osprey Tiltrotor, the company designed its munition to be flexible to fit on foreign aircraft as well. "In terms of export we have been cautious to not do anything that would present roadblocks to being able to provide this to international customers," the official said. Allies that operate light attack aircraft such as Brazil would be attractive candidates, the official noted.